This spice cake recipe from Cooks Illustrated is one of my favorite cake recipes this year. Aside from the great flavor and texture, it really is a versatile recipe that I could play with to transform it into something even more wonderful. By incorporating pear and ginger, it takes on a whole new flavor with chopped pears added for texture. I used canned pears in this recipe because the pears were already soft and I didn't have to worry about cooking fresh pears first. I suppose if you wanted to use fresh pears instead, you could chop them up and saute them in the browned butter and spices. Another thing I used was some of the syrup from the canned pears. I specifically used pears packed in light (lite) syrup since the cake had enough sugar. The syrup added another touch of pear flavor into the cake batter. For the ginger, I decided not to add it with the other spices. Instead, I added it to the batter separately to preserve it's flavor. I figured if it was combined with the rest of the spices, it would get lost somehow. For the frosting, I used a simple Vanilla Bean Buttercream out of convenience since I had 3 other cupcake flavors to frost using the same flavor as well. An idea is to reserve some of the spices used in the cake and stirring that into the buttercream to match with the cake. However for the frosting I made, I decided against working with a vanilla bean as called for in the original recipe. Instead, I used one of my favorite vanilla bean shortcuts, which is to use vanilla paste. It's a vanilla product combining the seeds of the bean with a thick, intense vanilla extract. I like the convenience of this product and I get the same flavor with specks of vanilla too. You can find vanilla paste online and at other gourmet retail shops. My preferred brand is made by Neilsen Massey. A buttery caramel ice cream topping finished these cupcakes off with a generous and sweet drizzle. Preheat the oven to 350 degrees F. Line 2 (12-cup) muffin pans with cupcake papers. Combine spices except the ginger in a small bowl. Drain the pears and reserve 1/3 cup of the liquid. Finely chop the canned pears and set aside. Whisk flour, baking powder, baking soda, and salt in medium bowl. In another small bowl, gently whisk eggs, yolks, and vanilla to combine. In standing mixer fitted with paddle attachment, cream remaining 12 tablespoons butter with sugar and molasses at medium-high speed until pale and fluffy, about 3 minutes, scraping down sides and bottom of bowl twice with rubber spatula. Reduce to medium speed and add cooled butter and spice mixture, ginger, reserved liquid from canned pears and half of egg mixture; mix until incorporated, about 15 seconds. Repeat with remaining egg mixture; scrape down bowl again. Reduce to low speed; add about one-third flour mixture, followed by half of buttermilk, mixing until just incorporated after each addition, about 5 seconds. Repeat using half of remaining flour mixture and all of remaining buttermilk. Scrape bowl and add remaining flour mixture; mix at medium speed until batter is thoroughly combined, about 15 seconds. Remove bowl from mixer and fold batter once or twice with rubber spatula to incorporate any remaining flour. Fold the chopped pears into the batter until fully incorporated. Using a star tip with a pastry bag, pipe the frosting onto the cupcake. 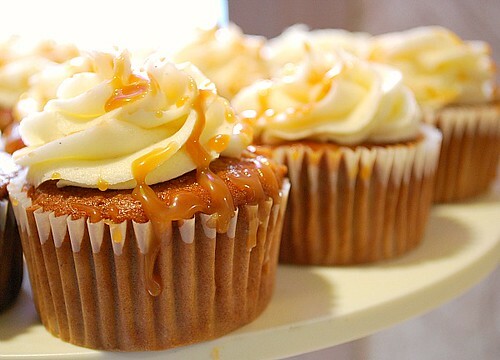 Drizzle the caramel topping over the frosted cupcakes using a fork or squeeze bottle for garnish. These look delicious and I've shared them on Facebook.com/EatCannedPears and Twitter too. Pacific Northwest Canned Pears has a Kids' Art Contest for ages 5-18 - it encourages kids to "Play With Your Pears" - two prizes of a $1,000 gift certificate for art/school supplies from SmileMakers. A great way to use up Halloween candy! Wow! I like the way you describe how pear and ginger became a great combination. I should probably try this since its totally a new combination for me. Thanks. Yummy! This pear and ginger cupcakes are good for everybody because of its flavor combination, if I'm not mistaken, ginger is juicy and fleshy with a very mild taste so its nice to know that this is one of your ingredients. Thank you for sharing. The whole idea is so amazing! I definitely love it. Thanks for sharing this nice cupcake recipe. would like to make minis. has anyone done this? can't wait to make these!